During our trip to Luoyang, China, the second peony garden we visited was the Shenzhou Peony Garden 神州牡丹园. 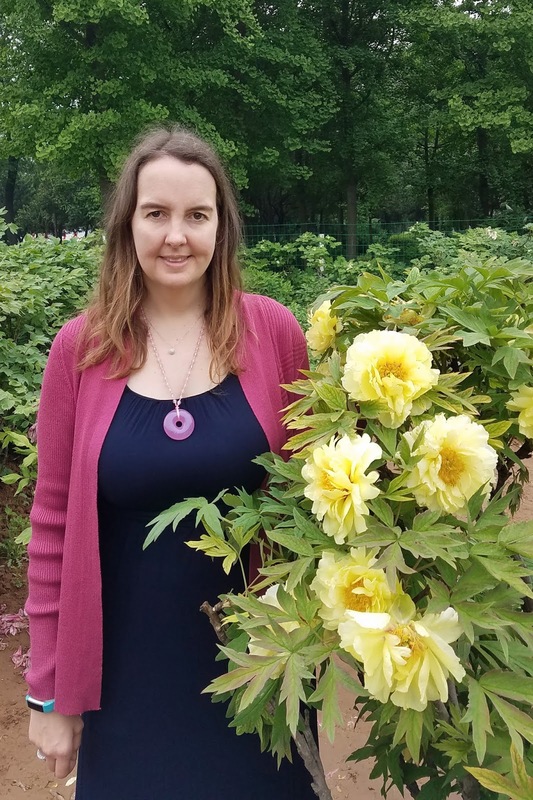 (If you missed the articles about the first garden we visited, you can find them here, 2018 Southern Peony Visits Luoyang National Peony Garden 洛阳国家牡丹园 (North) and 2018 Southern Peony Visits Luoyang National Peony Garden 洛阳国家牡丹园 (South).) The Shenzhou Peony Garden was more in the typical Chinese garden style with garden rooms and bridges, streams, water features, and rocks, etc. However instead of their garden being inside, their Chinese gardens were outside. Most of the tree peonies outside had finished flowering here as well, except for the yellow varieties, and a few green, orange, and purple. Inside the great hall of this garden, there were several large rooms with very high ceilings. There were lots of Luoyang style peony paintings for sale in the first room. In the next two rooms there were potted tree peonies being displayed in a large elevated area in the center of each room. The tree peonies were surrounded by a short, white fence made of turned wood pieces. The first of the tree peony rooms contained the white, near white, and pale pink tree peonies in bloom. They were all so gorgeous, so delicate, so heavenly. The second room of potted tree peonies contained all of the bright and vivid colored tree peonies. There were fanciful red & whites, fuchsias, bright lavenders, hot pinks, bold reds, dark maroons, and eye-popping purples. This room is definitely where all the drama was taking place. If you haven't witnessed any kind of peony craze before, I think this is a pretty close as you will come. The photo says it all. There were crowds of people all clamoring to get a photo of the pretty peonies with their cameras (or their phones). People were dueling with their selfie sticks to get their phone closest to the most beautiful blossoms. Peony lovers were jumping at the chance to take a selfie with the gorgeous trees peony blooms as well. The whole room was a flurry of people, cameras, and selfie sticks. It was definitely a sight to behold, and an experience I will never forget. On the walls of this great hall where the potted tree peonies were being displayed, were large printed metal sheets that contained all kinds of information about Chinese peonies. These metal sheets were probably 6 or 8 feet high and just as wide or wider. Both of the rooms' walls were filled with a dearth of Chinese tree peony information - cultivation, classification, origins, popular cultivars, etc. 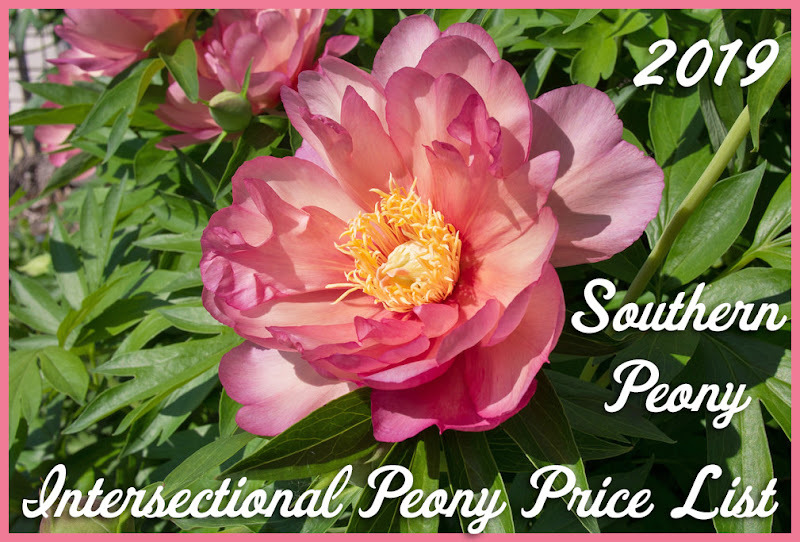 If you happened to be a peony nut, you could get lost in these gardens for days. It was almost surreal being surrounded by so much peony information, peony plants, peony history, peony culture. 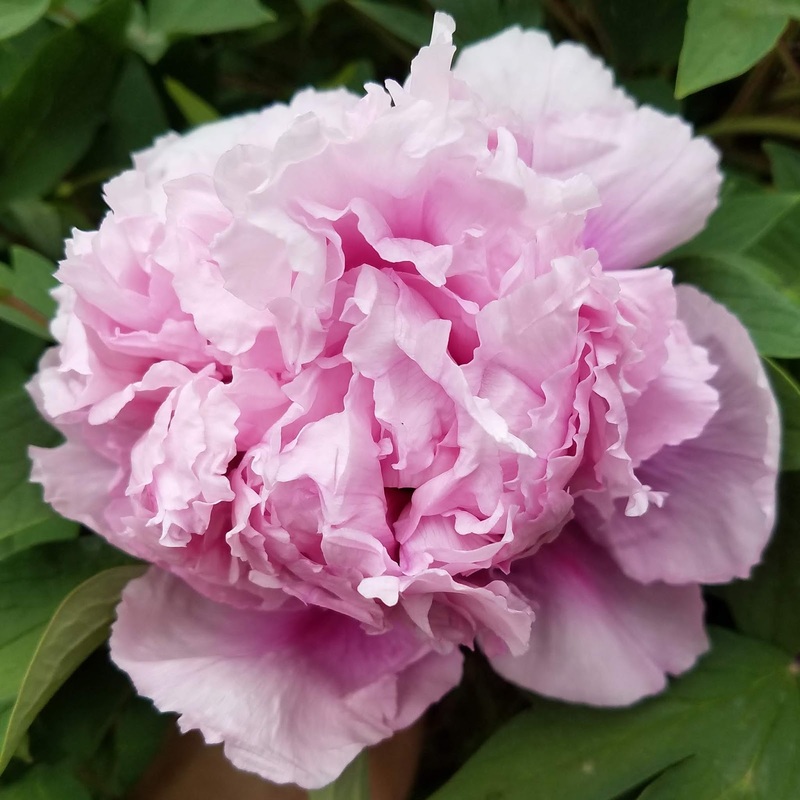 It was like a competition in my mind to select what to focus on, to be able to absorb as much "peony" as possible in the short amount of time I had to explore. 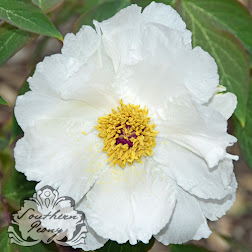 Many of their tree peony varieties were grown in raised beds with walls made of cement. The tree peonies in these raised beds were grown outside in the sun. Then when it was time for that section to flower and come into bloom (each section was planted with the same or similar variety), a large (huge) temporary shade cloth structures is set up over them while they bloom, to help the blooms last longer. 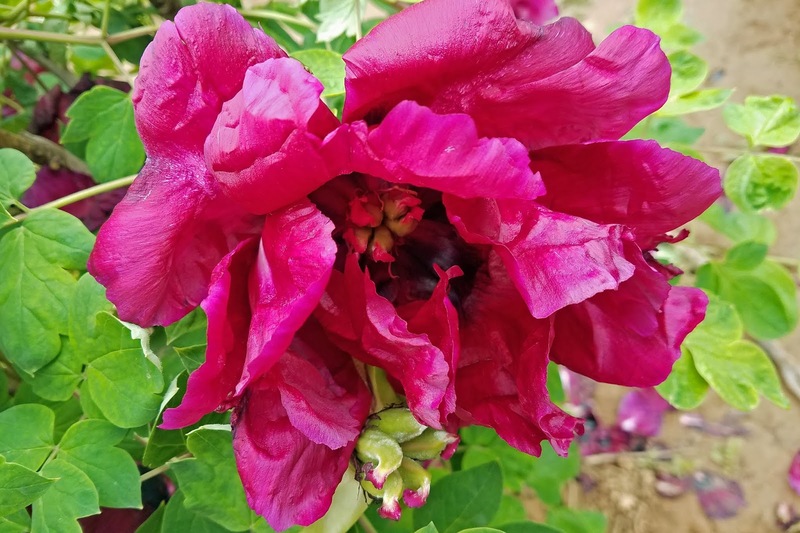 When that variety is done blooming, then they would move the shade cloth to a different section of tree peonies coming into bloom. They also had the one of the taller specimens of the Chinese garden natural rock sculptures here. It was in the center of a water feature. It was in the center of a circular pond surrounded by a low wall. It was reminiscent of a central fountain in the garden, with the rocks being the water that would have been sprayed into the air. These rocks did have water flowing down them in a waterfall style, with various plants growing among the nooks and crannies. The small pond surrounding the rocks contained a group of koi fish, to which the children enjoyed feeding bits of cookies. The herbaceous peony pictured above was by far my favorite Chinese herbaceous peony I saw on the whole trip. I want to say I've seen a picture of it before, but for the life of me, I cannot seem to find it again. I want to say the name has something to do with a star because of the pointed green petals in the middle of the flower that almost for a star shape. If anyone know what cultivar it is, please contact me! I'm sad to report that the majority of the peonies in the gardens I visited were not labeled with a cultivar name. 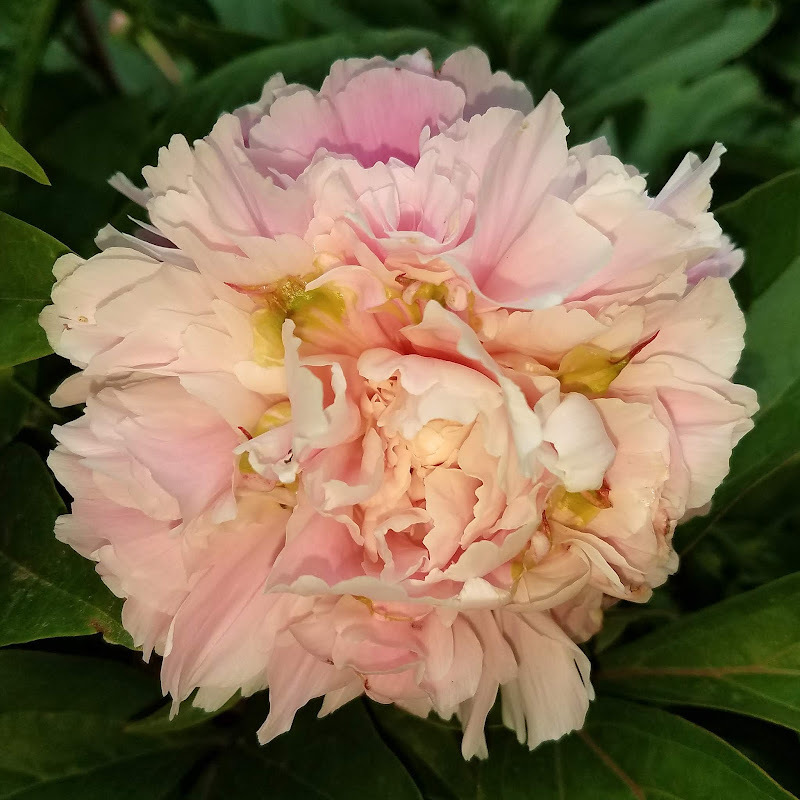 I saw a few (very few) plaques with some cultivar names in front of a couple of mass tree peony planting, but for the most part the peonies plants were not labeled. Hence the lack of names on the peony photos from my trip. 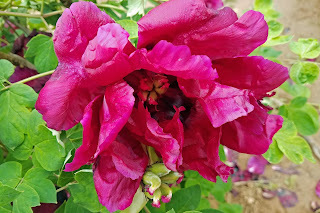 However the lack of labeled cultivar names did not take away from the beauty of the peony flowers, and we all still enjoyed seeing the wonderful and colorful shows they put on. This garden was just enormous, and I don't think I got to see the entire thing. I just kept leading my family (and in laws) from one section of the garden to another. About halfway through, they were ready to go and had seen enough. I think we spent about a half day here, but you could easily spend all day and you still may not see everything. 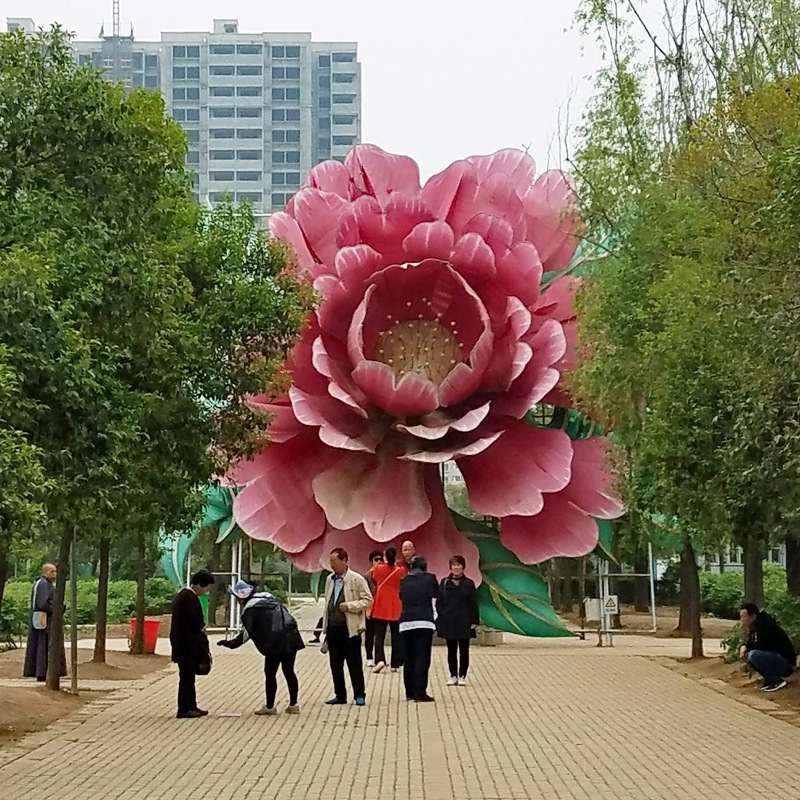 I pushed on and happened upon an awesome, towering sculpture of a pink peony blossom. That is definitely the largest peony I've ever seen! ;-) It almost made you realize what it feels like to be a honey bee! I also could not take my eyes off of this gorgeous purple tree peony. It had a hint of pink in it, but it my mind it was purple, and double and loaded with petals, and it had a cute skirt of purple guard petals. It was definitely my favorite tree peony I saw on the trip. I wish I knew what this variety was too (again no label). This one however was planted in a raised bed in a large group of the same variety as well. The effect was titillating! I just couldn't stop taking pictures of it! I also saw some people selling peony bouquets in the garden. Not a novel idea, but just something I'd never seen before. All of the peony stems they were selling were herbaceous peonies. I didn't inquire as to the price, but I bet it was super affordable due to the favorable exchange rate. Something else I noticed that really caught my eye were the palm trees growing in the garden - wait, what? Yes, palm trees. The weather in Luoyang was actually quite warm, and I'm guessing their growing zone was probably similiar to my own. I looked it up and found that Luoyang is the equivalent of USDA Growing Zone 8b! So they are actually a whole growing zone warmer than me! So if you need any further proof that peonies do grow well in warmer climates, there you have it, the peony capital of the world, Luoyang, China is in growing zone 8b. The place where peonies originated from is actually pretty hot! !